Often called the First Lady of Hollywood, Irene Dunne, in a long and distinguished screen career, juggled comedies, dramas, and musicals with aplomb, and all three genres were represented in her five Academy Award nominations. Her television career was equally successful, including appearances as host or guest on numerous comedies, dramas, and variety shows. Active in many civic and philanthropic causes, she also served as an alternate delegate to the United Nations. All aspects of her career are documented in this first in-depth study of her work, including much information never previously chronicled. The opening biographical overview features reminiscences from colleagues such as James Stewart and Ralph Bellamy. Dunne's multiple careers on stage and in motion pictures, radio, and television are fully detailed in separate chapters, as are her recordings, song sheets, and numerous awards and nominations. 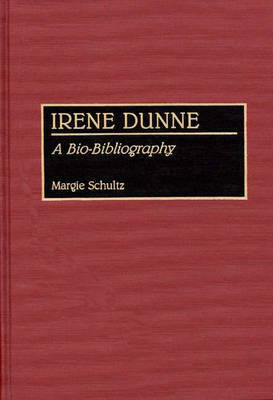 An annotated bibliography records the diverse writings by and about her, and a list of magazine covers featuring Dunne over a period of twenty years is appended. All sections are fully cross-referenced and indexed. Photographs are also included--ranging from her childhood to her last public appearance as a recipient of the Kennedy Center Honors in 1985. A worthy tribute to this talented and beloved actress, this book will be an important source for research on Irene Dunne and her world.